Another great and fun friends to lovers story! Christina Lauren really can do no wrong in my opinion. Five best friends who embark on the dating app world and it’s getting a bit dicey! They are all a bit quirky, and unique in their own way and have a friendship that many rival. Four guys and Millie. Reid and Millie have always been close, but one night that all changes. But it’s just a one-time thing right?? I love a romantic comedy and Christina Lauren and the duo to beat right now! They keep you reading until the wee hours of the morning, under your desk at work and at a stop light (I know it’s wrong but damn this book had me hooked). Sneaking some giggles without others at work seeing me was quite the feat! These two characters are so great together as friends and when they are together it’s fantastic! Two nerdy people but intelligent people navigating the dating scene is just perfection. I loved that Reid was the one looking for the romance that Millie was unsure. She was a bit hesitant and Reid takes the reigns in their friendship and relationship. An absolute must-read for the romance and rom-com reader! 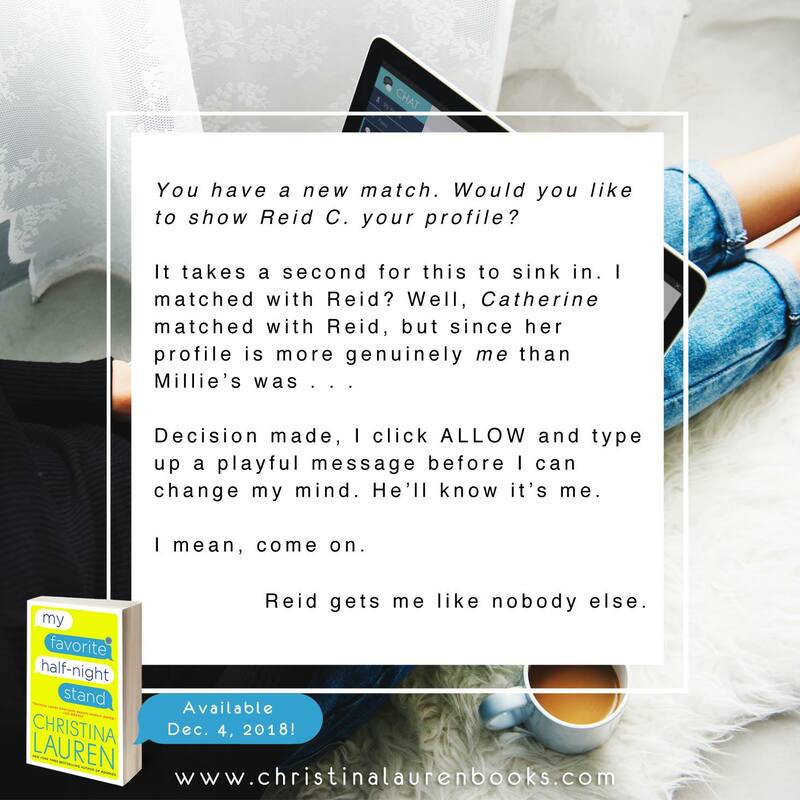 Adorably witty, entertaining and laugh out loud funny, Christina Lauren’s My Favorite Half Night Stand slapped a stupid smile on my face and kept me up reading past my bedtime. Not only did I love Millie and Reid, but the entire cast of supporting characters coupled with the romantic elements just knocked it out of the park for me. The banter and dialogue is so fresh, the storyline is captivating and most of all, the GEEK that exists in one shape or form throughout the entire cast is just so endearing. I have a total weak spot for nerdy heroes and Reid is it for ME. He’s a super intelligent college professor (YES please) who is smokin hot and a hopeless romantic. For me, it just doesn’t get any better. Millie (how adorable is that name) is equally as intelligent and successful and her quirkiness is a perfect match to Reid’s inner nerd. I loved their friendship and watching them become more than friends was completely heartwarming. If you’re looking for a sweet, laugh out loud funny and adorably nerdy tale of the woes of internet dating and are a sucker for a little bit of friends to lovers, then this is the book for you! Friends to lovers is one of my favorite tropes! In the era of Tinder and Plenty of Fish, why wouldn’t five friends use an app to get a date? Or to find love? Each needing a date for the department gala, that’s exactly what these five friends decide to do. All very educated, highly intelligent, college professors who have no idea about current dating practices because they work all the time. Reid and Millie have always been the closest to each other. One night the lines are crossed and things get hot and heavy. What’s a little one night or half night stand among friends – no biggie right? Reid would like to explore something more but Millie wants to go back to being friends. It’s difficult to go back to being friends when you each know how the other taste. When you know exactly how deep she likes it? When you know just where to lick him? These two are kidding themselves! IRL (In Real Life) becomes a means to an end. Once the profiles are set up, with a big assist from Millie, they sit back and wait to see who gets the first hit. AND that’s when things start going awry. Millie feels the need to let loose on her profile after being teased by the guys. She creates a second profile as Cat and Reid responds. So now Millie is jealous of herself but Reid doesn’t know Millie is actually Cat. There are plenty of laugh out loud moments here. The group text chats are very funny. There are also heartfelt moments too. 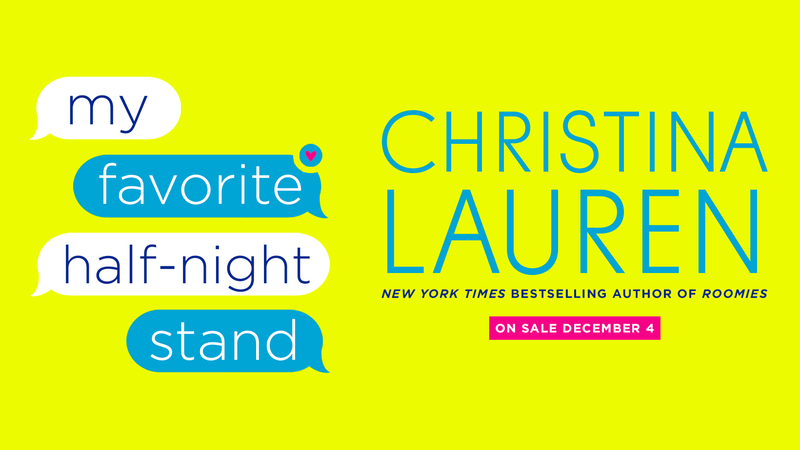 I’m My Favorite Half Night Stand Christina Lauren has given us a delightful rom-com with plenty of heart. 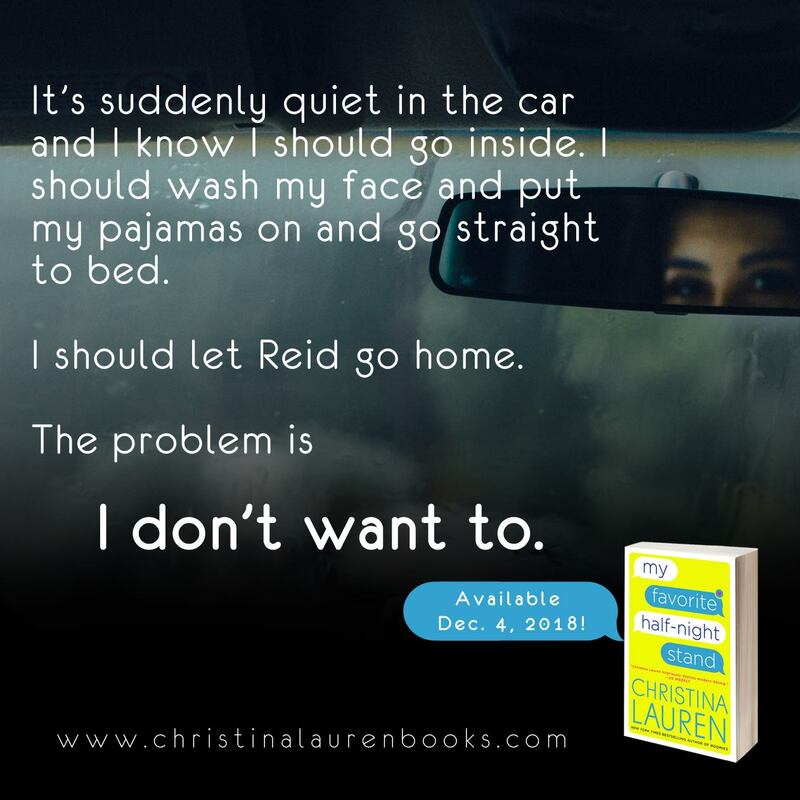 Christina Lauren is the combined pen name of long-time writing partners/besties/soulmates and brain-twins, Christina Hobbs and Lauren Billings. They are the authors of several Young Adult and Adult Fiction titles, and have been translated in over 20 languages. Some of their books have kissing. Some of their books have A LOT of kissing.